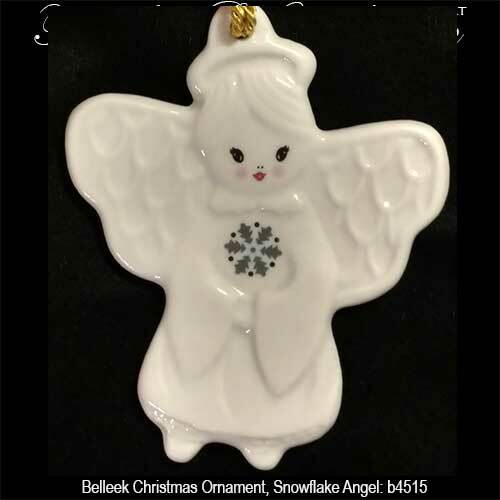 Belleek Christmas ornaments ranging from the current Belleek annual ornament to more vintage decorations and baubles. 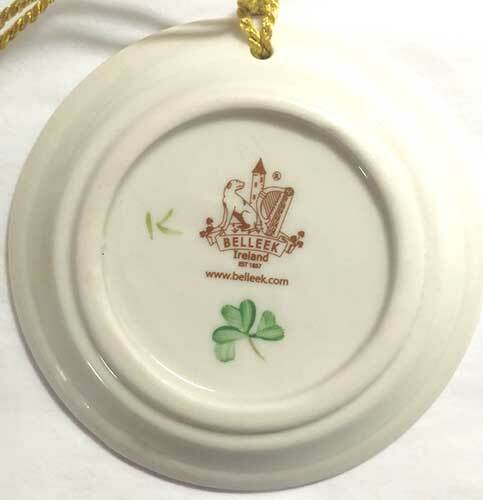 The Belleek Pottery has been producing fine china gifts from their home in Belleek, Ireland since 1857. 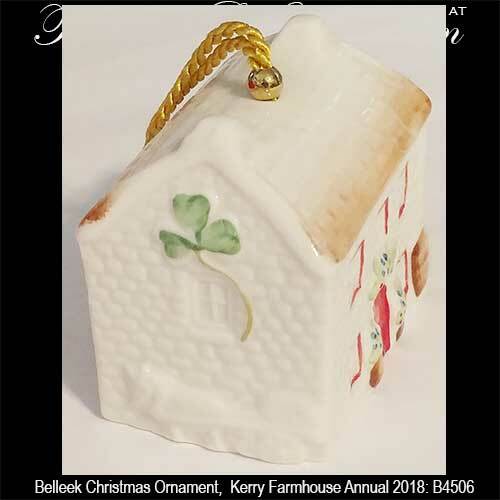 You will enjoy giving and receiving Belleek Christmas ornaments, many feature their signature hand painted shamrocks, and these ornaments are destined to become family heirlooms. 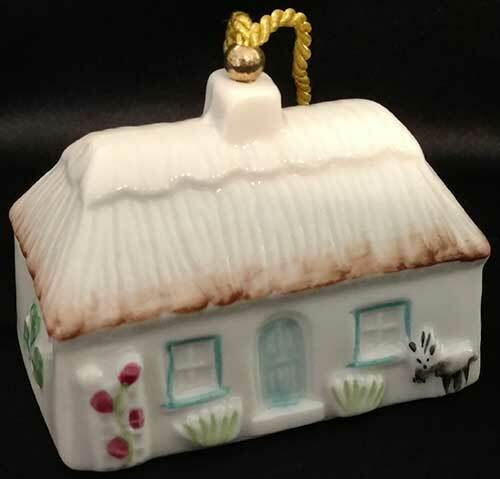 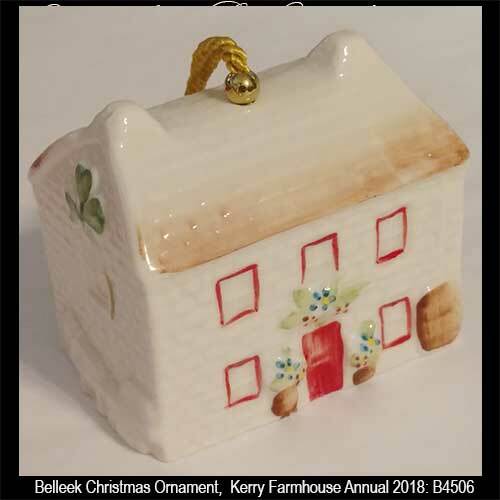 Belleek annual Christmas ornament is the Azalea Cottage bell; it is the 32st edition for 2019. 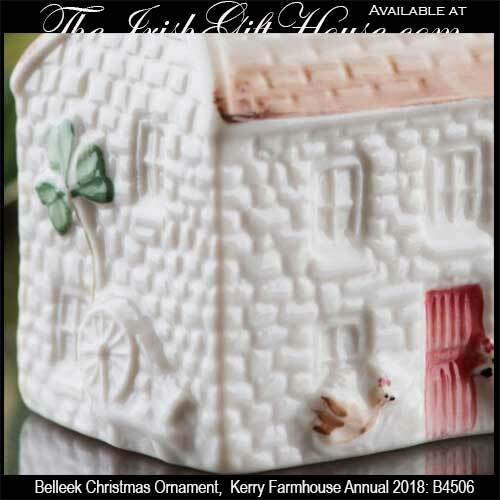 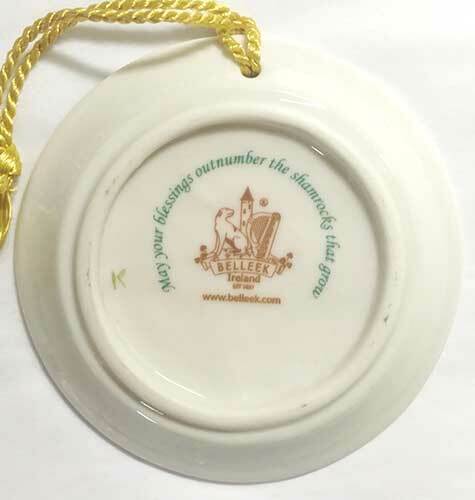 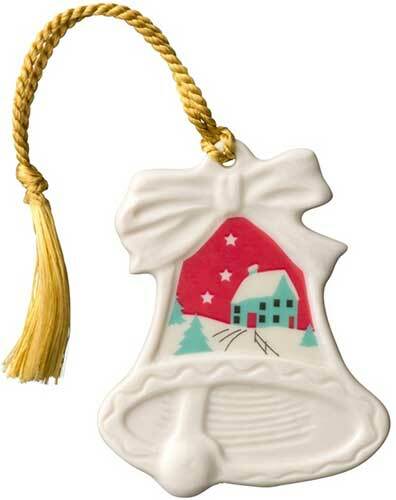 Belleek annual Christmas ornament is the Kerry Farmhouse bell; it is the 31st edition for 2018. 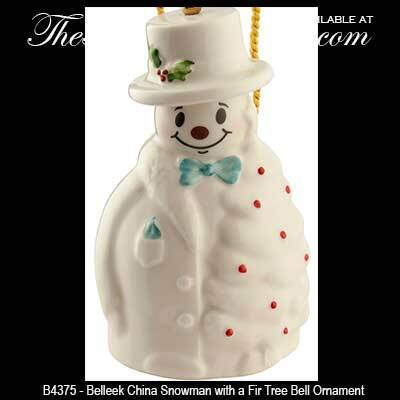 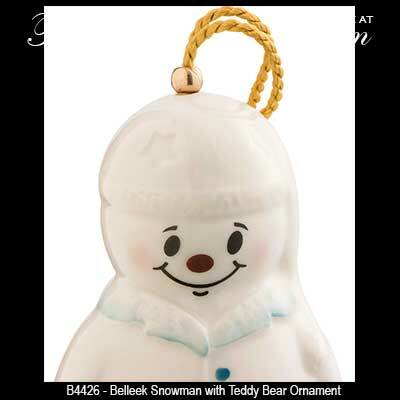 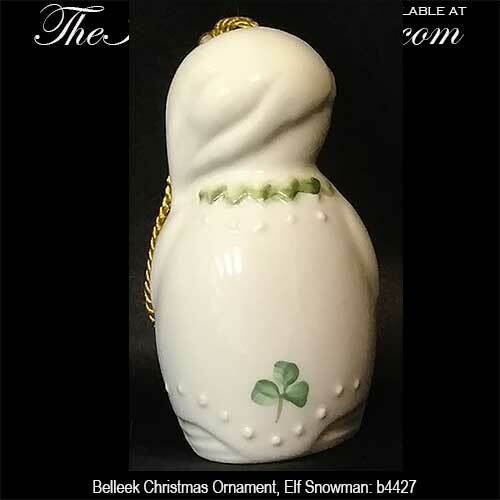 Belleek snowman ornament is dressed as an elf who holding a Christmas present with a red bow. 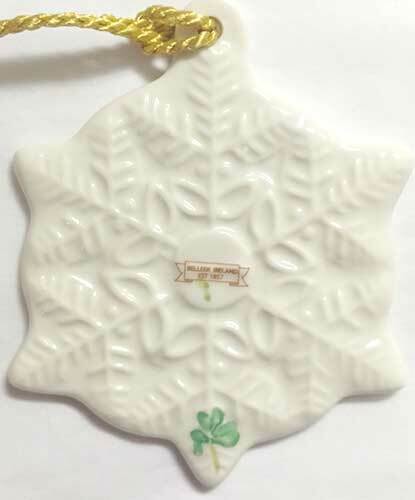 Angel ornament from Belleek features a snowflake and embossed detailing along with a hand painted shamrock. 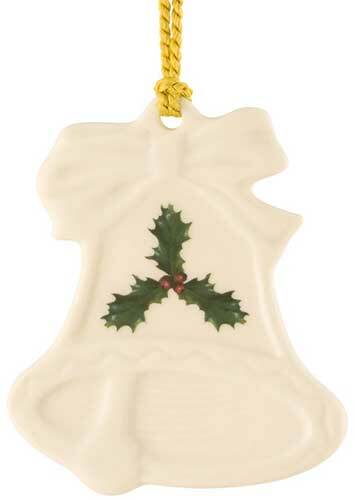 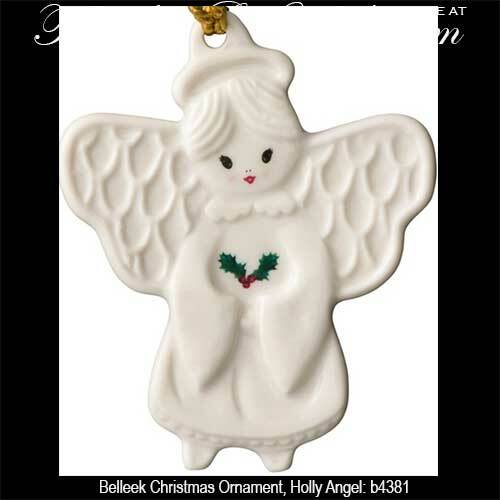 Belleek angel ornament features holly leaves along with embossed detailing. 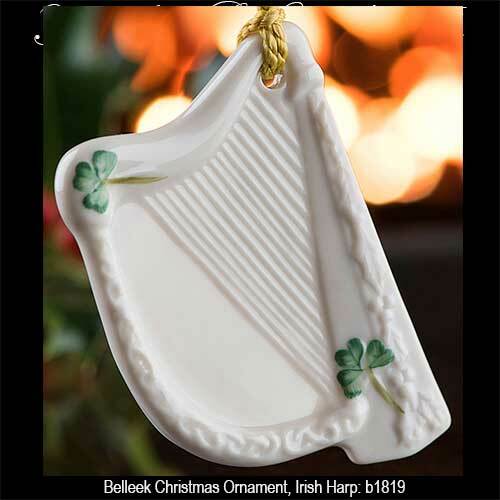 Irish harp ornament from Belleek is a double sided design that features embossed accenting along with a hand painted shamrocks. 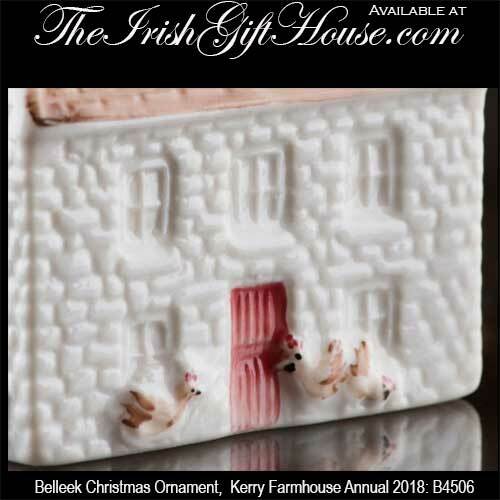 Belleek ornament is a mini plate that features a Christmas scene along with an Irish blessing and a Celtic knot-work border. 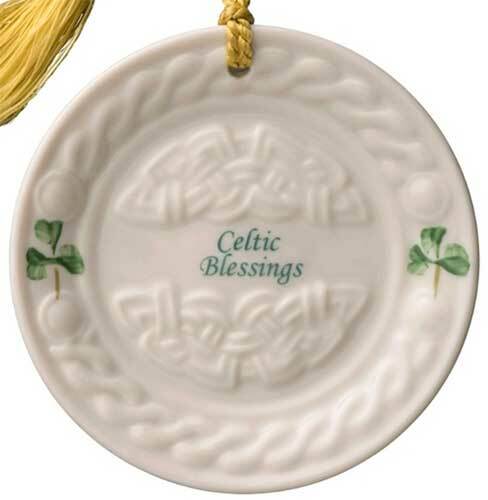 Belleek ornament is a mini plate that features the words Celtic Blessings along with shamrocks and embossed knot-work. 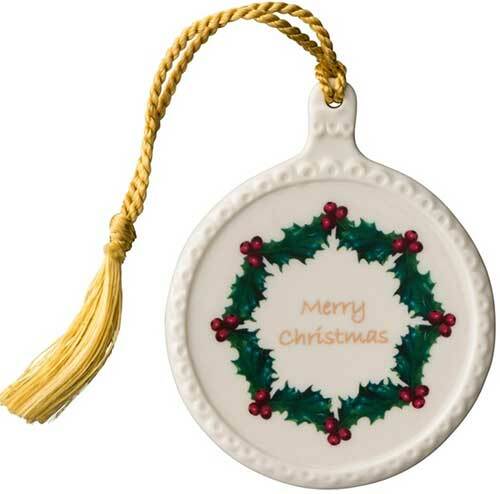 Belleek ornament is a fine china disk that features the words Merry Christmas along with holly and berries and an embossed border. 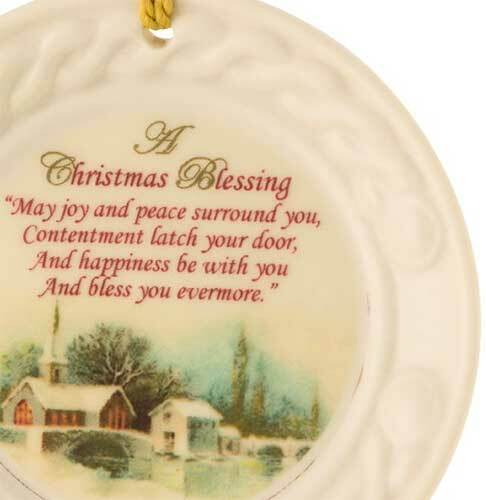 Belleek ornament is a fine china design that features plum pudding and holly and berries along with the words Merry Christmas and an embossed border. 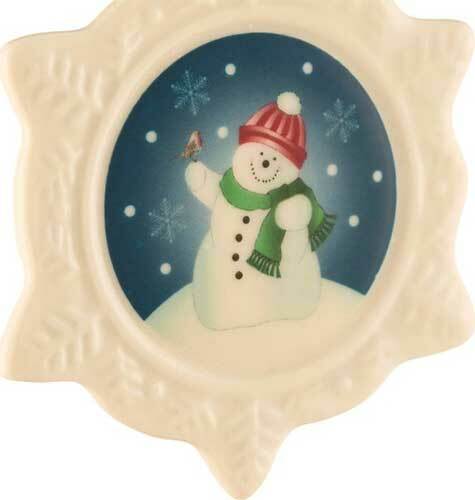 Belleek ornament is a fine china snowflake that features embossed detailing along with a festive snowman in the center. 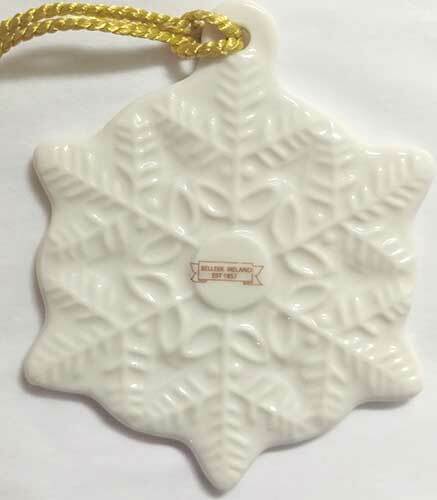 Belleek ornament is a fine china snowflake that features embossed detailing along with a reindeer in the center. 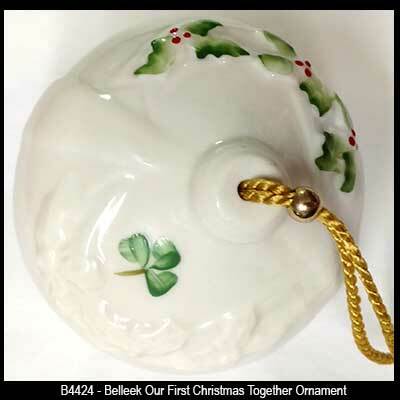 Belleek ornament is fine china in the shape of a bell that is enhanced with holly and berries. 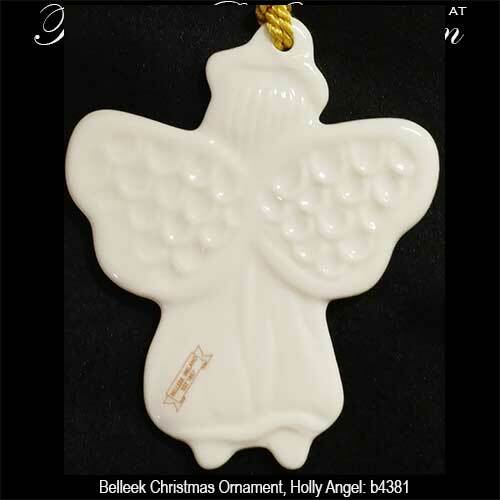 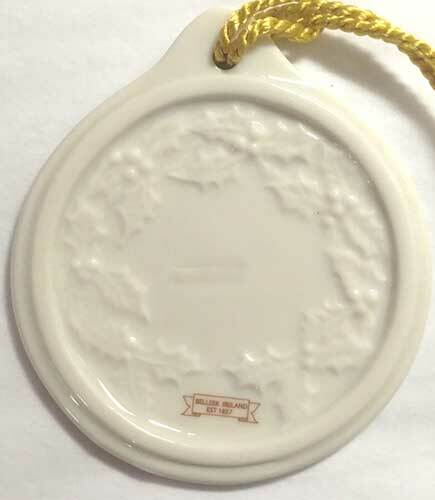 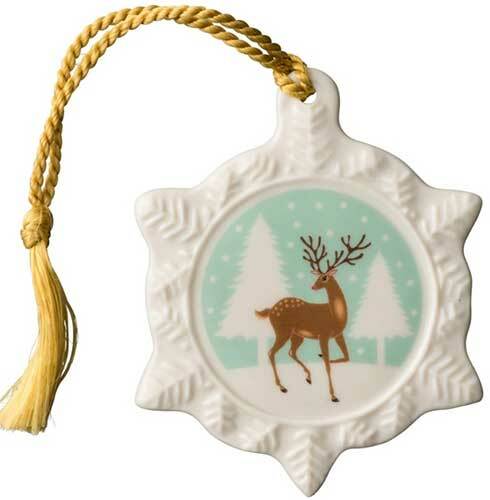 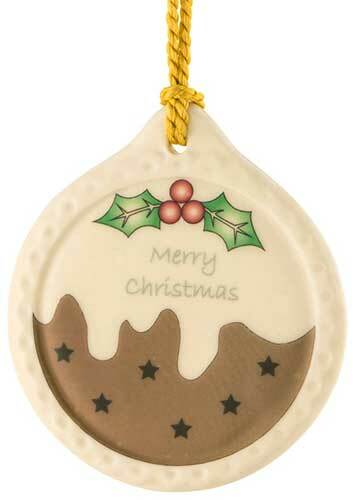 Belleek ornament is fine china in the shape of a bell that is enhanced with a Christmas motif. 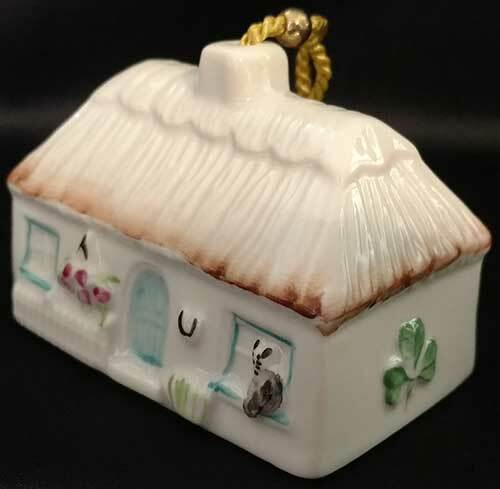 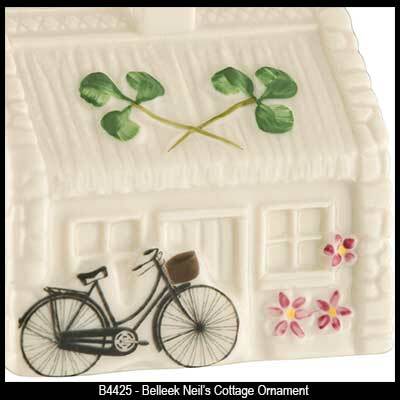 Nell's Cottage ornament from Belleek features hand painted shamrocks. 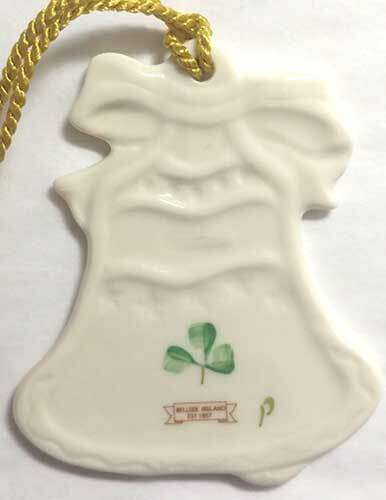 Irish angel ornament from Belleek features a hand painted shamrock and a banner that says Believe. 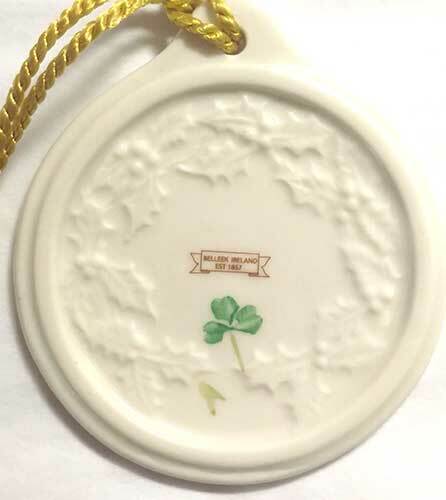 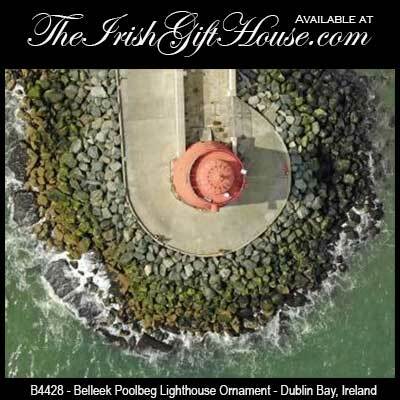 Belleek lighthouse ornament with shamrocks is a replica of the landmark at Poolbeg in Dublin, Ireland. 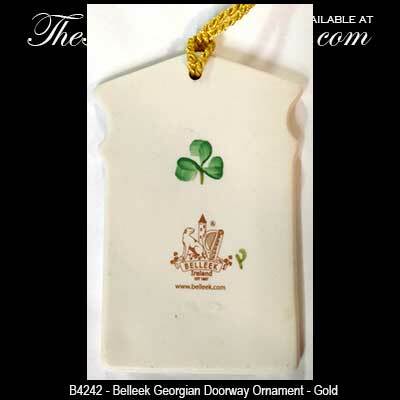 Belleek gold doorway ornament is in the Georgian style. 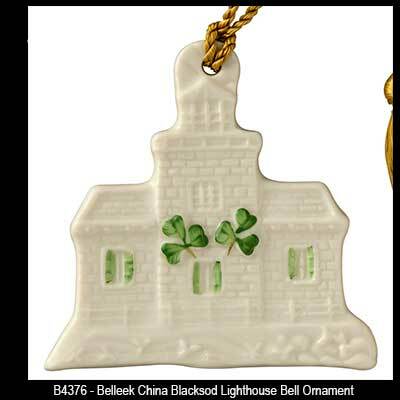 Belleek Blacksod Lighthouse ornament is designed after its namesake in Co. Mayo, Ireland. 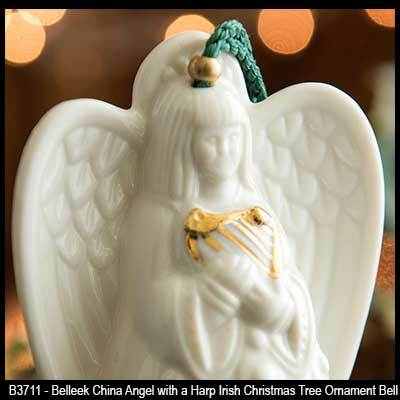 Belleek Irish angel Christmas ornament is holding a harp, the national symbol of Ireland. 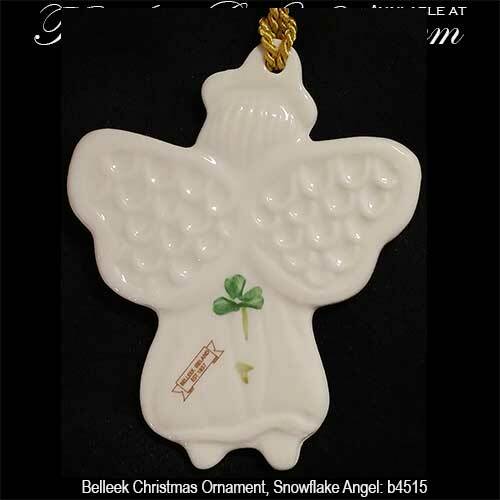 Belleek ornament celebrates our first Christmas together for 2015. 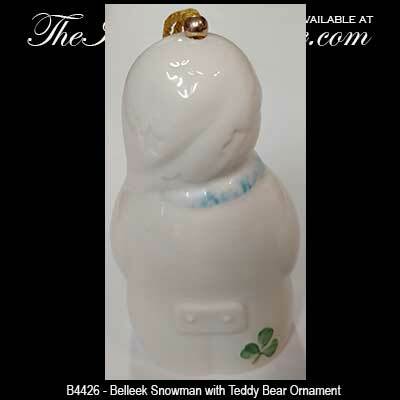 Belleek is one of the finest china in the world and these baubles and bells are no exception; however, if you would like to view additional selections The Irish Gift House features a huge and eclectic selection of Irish Christmas ornaments and additionally we have Irish decorations from Royal Tara China.